Who is The Lawn Man? Why Choose The Lawn Man? Why a lawn care service? Home » Why do you need a lawn care service? Why do you need a lawn care service? As you probably know, just mowing your lawn is usually not enough to get a beautiful, hard wearing lawn. If left alone, weeds and moss will gradually encroach and your lawn will soon become an untidy mess. The longer you leave it, the harder it is to restore back to its former glory. So, why do you need a lawn care service? A lawn burnt with an autumn weed and feed treatment. To get the results you want, you need to use a professional lawn treatment service. Often, DIY lawn care products either do nothing at all, or are so strong you actually make the problem worse by killing your grass! 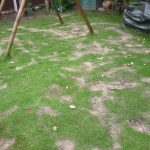 The Lawn Man can help you avoid the guess work involved with treating the lawn yourself by providing a flexible, low cost solution to achieving the lawn of your dreams. You can trust a lawn care provider get you onto the path towards a beautiful lawn. The Lawn Man specialises in regenerating even the most challenging lawns into lush, green outdoor spaces that their owners can be proud of. The Lawn Man will help them to keep it that way. The number of lawn care products available in the shops can be overwhelming, with many products claiming to be the solution to all your lawn’s problems in one easy application. However, the truth is that many lawn products try to treat every symptom poorly, not actually solving any of them. A professional lawn care service will treat specific lawn problems with scientifically proven solutions and industry leading treatments. You can be sure the products used are safe for you, your family and the environment. They will be applied safely and correctly and best of all they will work. Often with spectacular results. Every lawn cries out for regular maintenance, all year round. The Lawn Man takes the stress out of regular maintenance, and you can be sure that the correct treatment is always applied at the correct time of year. A reputable lawn treatment service will contact you when the next treatment is due, giving you flexibility of when the treatment is applied, leaving you to just simply enjoy the benefits of a great lawn. How do you know if you are maintaining your lawn correctly? Are you mowing at the right height? Are there any areas that require special attention? Do you have any pests or diseases? You could read the dozens of lawn care books on the market, but often they are vague about specifics and can even contradict each other or baffle you with over complicated issues which are just not relevant. Your local lawn care specialist is an expert of lawns in your area, and will be knowledgeable of local lawn care issues. You will get professional feedback on your your current lawn care regime and give you tips and advice on things you can do to help your lawn look it’s best. Weed killers and other lawn care chemicals can be a risk to keep at home. Avoid having to store these containers and keep your family safe. A professional lawn care company uses products completely and disposes of any containers in an environmentally friendly way. You maybe thinking that such a service costs the earth, but you’d be wrong. Often, a professional lawn care service works out cheaper than buying the products and applying them yourself. With the added benefits of having the treatments applied correctly, guaranteed! Don’t spend another year wishing for that perfect lawn. Let The Lawn Man tailor a plan to make it beautiful … guaranteed!